What is the difference between inductive coupling and resonant inductive coupling? The resonant inductive coupling is better than inductive coupling, the difference between them, is that resonant inductive coupling use the "resonance" in their favor. But what is the difference in the diagram of both? So, the only difference according to the image, is that the resonant circuit, uses 2 wire circles, called "broadband antenna" and "pick up antenna", but this is really so? (And if so, why those circles help? so much) or are there more differences in its diagrams? In addition to these images, I have seen that the function of these circles is to match the impedance, I would appreciate your help. If you resonate a coil with a parallel capacitor and apply a sinewave excitation to it (at the resonant frequency), the theoretical current that can build-up in the coil is much higher than the actual current applied to the parallel resonant coil. Think about a coil of 1 uH excited at 300 kHz. It has an impedance of \$2\pi fL\$ or 1.884 ohms. If you applied a 10 volt RMS sinewave to it, you would get a current of 5.31 amps. However, if you took a capacitor of 282 nF, it has an impedance also of 1.884 ohms but its impedance is negative relative to the inductor's impedance. This of course equals infinity. 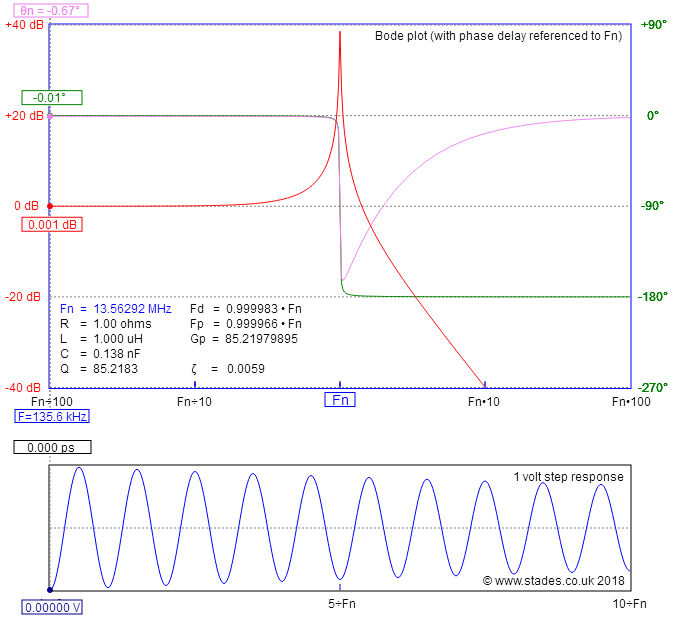 You have perfectly tuned a capacitor and inductor to produce infinite ohms as seen by the driving voltage. But there is still 5.31 amps RMS flowing in the coil because, taken individually you still have 10 V RMS across an inductive impedance of 1.884 ohms. It so happens that the capacitor current (also 5.31 amps) is exactly cancelled by the inductor current and, as far as the driving singal is concerned it sees an open circuit. But what form of black magic is this you might say? There is no black magic - it takes time to build up this current and during that time, the 10 volt sine wave is providing energy slowly into the L and C. After a few hundred or so cycles you are probably nearly there for most circuits and the sine wave is hardly asked to do anything more. Except when you decide to remove power by having another coil located close by that takes power and converts it into heat (as most electronic devices do). So, a parallel resonant transmit coil is "aided" by tuning in that it can create a big flux (due to the big current) and it doesn't need thumping big pairs of transistors to generate sine wave current. So I've shown Vin as the induced receiver voltage and on the output there is nearly a 40 dB increase in output voltage. This would make an induced voltage of (say) 100 mV into 10 V RMS and quite suitable for rectification and conversion to DC. One is resonant tuned and the other isn't. So, the only difference according to the image, is that the resonant circuit, uses 2 wire circles, called "broadband antenna" and "pick up antenna", but this is really so? No it isn't the normal case. You have a transmit coil and a receive coil and they are both directly tuned with capacitors. Whether the coils are single turn loops with a tuning capacitor (suitable for higher frequencies) or multiple turn coils with a tuning capacitor is down to how the designer prefers things. You could make an argument that the single turn coil is 100% coupled to its tuned local multiturn coil (i.e. a transformer) just for the convenience of the driving circuit. However, the principle is the same and I use (or have used) directly tuned coils for both transmit and receive. That is because the single turn coil and the multiturn coil act like a step up transformer and a low impedance driving circuit can make a multiturn coil resonant at a much higher voltage. This is based on the turns ratio. However this is not a principle associated with resonant tuning - it's just a convenience for the designer. Not the answer you're looking for? Browse other questions tagged wireless energy or ask your own question. How to get the correct resistance and electrical intensity for this circuit? Is there any difference between “induction” and “resonant” wireless energy transfer? difference between voice and data services? Difference between Voltage source and Current source? What is the difference between narrowband and wideband? How does the diagram really work?